(Nanowerk News) Shunsuke Yuba, Takashi Kawasaki, Kazuhiro Fujimoriand Tomonori Deguchi from the Research Institute for Cell Engineering of the National Institute of Advanced Industrial Science and Technology (AIST), in collaboration with Yasuhiro Kamei, Radiation Biology Center, Kyoto University, Shin Takagi, Department of Biological Science, Graduate School of Science, Nagoya University and Takashi Funatsu, Laboratory of Bio-Analytical Chemistry, Graduate School of Pharmaceutical Sciences, The University of Tokyo have developed a new microscopic technology which can achieve a single-cell gene induction by heat-shock response evoked with cell heating using infrared laser irradiation under a microscope in vivo. Heat-shock response is one of stress responses in animal cells. In a cell, heating over a criterion triggers gene expression of heat shock proteins that recover damaged proteins in the cell. We can turn on a desired gene fused with this response system by heating cells. The gene induction by single-cell heating requires strict heat-control technique, since excess heating kills the cell. There was no method to measure temperature in a single cell so far. In this study, we utilized Green Fluorescent Protein (GFP) as a thermal probe. Fluorescence of GFP reduces as temperature increases. Utilizing this property, we measured microenvironmental temperature shift evoked by infrared (IR) laser irradiation under the microscope. The results indicated that heating area by the IR laser irradiation is restricted within a small area, nearly as a single-cell size. We applied the technology for living organism, nematode (C. elegans), that is a widely used model animal in developmental biology and differentiation studies. We succeed in single-cell gene expression and manipulating cell behavior. The new microscopic technology has possibilities to apply for many species, and a target gene expression in a desired single cell will reveal gene functions in vivo. The research results have been published in Nature Methods in January, 2009. Left: A new microscope system (IR-LEGO) for single-cell gene induction in vivo using IR-laser. Right: GFP expression induced by IR-laser irradiation to a single neuron (arrow) in C. elegans which carries hsp::GFP transgene. In various species, genome projects have progressed or finished and then massive amount of genes have been discovered or predicted in their genome. Simultaneously, “post-genome“ study such as a comprehensive gene function analysis so-called proteome analysis started to estimate functions of the predicted genes. The gene function analysis is very important not only for basic biological research but also for the benefit of society through medical and pharmaceutical research. Recent gene function analysis approaches are not in vivo studies. The in vitro data can not be applied to the in vivo function directly. The original function of the gene must be analyzed in cells in vivo. So it was needed to express the target gene in the target cells (or tissue) at a desired timing in vivo for a direct demonstration of the target gene function. A decade ago, a laser focusing method for gene induction was reported. 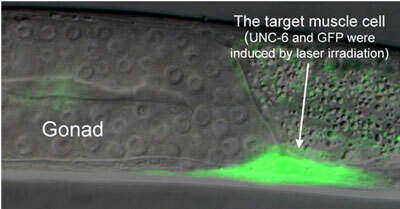 The method utilized laser cell-ablation system using a visible light laser. Mild irradiation of the visible laser, indeed, induced a gene that constructed under the heat shock promoter, but the light of short wavelength damaged cells. The damage disturbed the subsequent cell division or other cell activities, thereby the method was not a valuable tool. We then started development of a novel microscopic system specialized for single cell gene induction. First, we chose infrared (IR) light for the cell heating, because the IR light can heat water that is the main constituent of cells and IR light does not damage the cells. Second, we decided to evaluate microenvironmental heating profiles, time course of temperature and distribution of temperature in the space, evoked by IR laser focusing under a microscope However, there was not a way to measure the microenvironmental temperature. So we started to prove the validity of a GFP for temperature measurement utilizing its physical property. And we evaluated heating profiles evoked by focusing IR laser under a microscope. Finally, we applied our system to a living organism, nematode (C. elegance), and confirmed the validity of the system as a single-cell gene induction method. This research was mainly supported by the PRESTO and ‘‘Modeling of Innovative Research Results’’ research grants of Japan Science and Technology Agency. We developed a new gene induction method in a targeted single cell under a microscope using IR laser. This method utilized a mechanism of heat shock response which was conserved in the most of species and the heat was evoked by focusing the IR laser to the target cell in vivo. We named this system “infrared laser evoked gene operator” (IR-LEGO). The IR laser light (wavelength : 1480 nm) does not dissociate molecules in cells, so unlike ultraviolet and visible light lasers, we can avoid cell damage due to photochemical reactants generated by the laser irradiation. On the other hand, IR light does not damage cells and can warm water, the main constituent of cells, effectively. Since excess heating, however, causes damage or death of the cells, controlled heating was required for the heat shock induction. In order to keep a target cell at the heat shock inducing temperature and other cells at lower temperature, we have to evaluate a time course of temperature and three-dimensional temperature distribution in a microemvironment induced by the laser irradiation. Because there was no method to measure temperature in microenvironment, we utilized a GFP as a thermometer. The GFP is widely used as a marker of gene expression or a tag of proteins in molecular biological studies, meanwhile, fluorescence intensity of GFP depends on temperature. We utilized this property for measurement of temperature shift in microenvironment due to a local IR laser heating. We also clarified controllability of the system for single-cell heating by analyzing spatial distribution of temperature in microscopic region. Figure 1. Serial microscopic images of GFP expressing E. coli (enhanced image) and its temperature variation induced by IR laser irradiation. 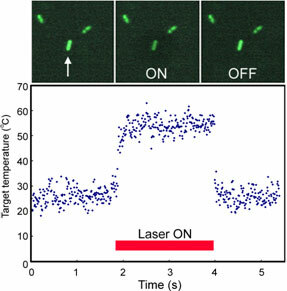 Only the target bacterium (arrow) was heated by IR right, and then fluorescence was reduced. The graph shows the temperature calculated form the fluorescent intensity. The temperature of the target bacterium was jumped up by the IR irradiation and stayed constant during the irradiation. We induced gene expression in a single cell of nematode, C. elegans, using this system. C. elegans is often used in studies of animal development and differentiation. It has about 1,000 cells in adulthood and fates of all the cells were revealed. Distal tip cells (DTCs) of a nematode migrate in the body and control gonad formation. When the DTCs migrate through the body, another cell expresses a guidance gene, UNC-6, that controls the direction of DTC movement. In an UNC-6 defective mutant nematode, its gonad formation is abnormal due to lack of proper migraton of DTCs. We introduced transgene, which induces UNC-6 expression by heat shock, to this mutant. When a single muscle cell, which originally expresses UNC-6 in wild type, was heated by IR irradiation, the cell expressed UNC-6. And DTCs migrate properly and a normal gonad was formed in a high rate (Figure 2). This is the first example of in vivo demonstration of UNC-6 function, i.e. control of DTC migration. Expression of UNC-6 in other cells does not control DTC migration properly. This experiment demonstrated effectiveness of IR-LEGO system in in vivo gene function analyses. Figure 2. A physiological demonstration of single-cell gene induction using IR-LEGO. The target muscle cell was irradiated by an IR laser using IR-LEGO system. By the irradiation, the cell expressed UNC-6 and GFP (arrow), and then migration of DTC was controlled properly. A gonad was normally formed (normal U-shape). We are planning to apply this technology to medical research, so we utilize the system for medaka that is a vertebrate and has the same organs and systems as humans. For basic research using other model animals, we are preparing collaborations with other researchers. We also started reseaches using zebrafishes and Drosophila, as well as medaka. They are most popular model animals with accumulated biological information, and they are possible human disease models. We think our technology will become a powerful tool for research in mechanisms of neural diseases, such as Parkinson’s disease, by the single-cell gene induction and gene function analyses in neurons using disease model animals.